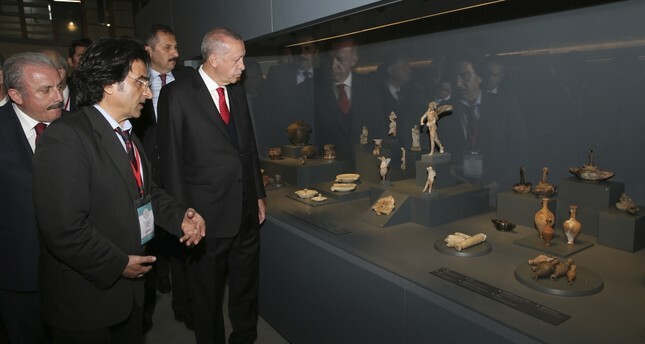 President Erdoğan examined the pieces at the Troy Museum. Built on the Troy archaeological site, which brings light to the 5,000-year history of Çanakkale province, the Troy Museum was opened by Turkish President Recep Tayyip Erdoğan yesterday. Speaking at the opening ceremony, the president said, "We have carried out many projects in Çanakkale and the peninsula region. We brought the ancient history of this region back to a universal cultural treasure. We have made great efforts as of the first period of my prime ministry time back in the day in order to save our martyrdom, where thousands of martyrs cuddle up together in the soil, from neglect. In the end, we have provided an identity that is proper to the spirit, meaning and importance of the epic written in Çanakkale a century ago. We have managed to make the martyrdom a place which is visited by our citizens from all four corners of the country and of which they are proud." Highlighting that the Troy Museum is the latest example of the efforts made to transfer Turkish history to the next generations, President Erdoğan continued, "Troy is one of the most important historical places in our country and was registered on the World Heritage List [of UNESCO] in 1998. We also announced 2018 as the Year of Troy and provided better publicity to it at home and abroad. Today, we are opening this museum, which presents the historical treasures to the advantage of all humanity. We started to build it in 2013 and completed it with an investment of TL 64.4 million. We exhibit 1,746 works in total here. While 52 of them are on open display, 1,712 ones are on closed display. We present an opportunity to exhibit both the archaeological artifacts revealed as a result of the excavations here and Troy works that have been found in other countries in the most beautiful way. In addition, we continue our work to bring lost artifacts exhibited in the museum from abroad [back home]. I hope that our Ministry of Culture will follow the process with sensitivity and enrich this place." With the museum project, Troy's treasures that were smuggled and made their way abroad were returned to the lands to which they belong. The museum has given hope that all of Troy's treasures that are on display at seven museums around the world will be returned. What makes Troy so important is the fact that it is considered a reference point for several civilizations. One can see the influence of Troy from Greek mythology to the roots of European culture. It has influenced people from the Caucasus, Persia and several Anatolian civilizations. We can see it in the roots of Rome and Paris and much more. It was built with an indoor area of approximately 11,200 square meters on 100 acres of land at the entrance of the archaeological site of Troy.